The Volvo Ocean Race at Fan Pier will host an unforgettable afternoon by the waterfront with the Legal Sea Foods Oyster Festival Presented by Grey Goose on Saturday May 9, 2009 in Boston. The Festival will overlook the harbor side docks of Race Village. Legal Sea Foods will showcase several varieties of oysters on the half shell. 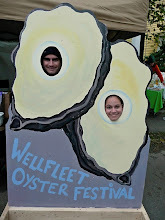 Oyster experts will be on hand to share recipes, flavor profiles, history and to teach the art of shucking an oyster!